Most of the eye injuries that occur from skiing or snowboarding happen because of a bad choice in ski goggles, or no goggles at all. If you take a serious fall with improper goggles on, the lens can shatter and the pieces can cut your eye. If you aren't wearing goggles, a low branch can seriously injure you eye. The right kind of lens can also help you see better on the snow. Light reflects of the snow, creating enormous glare. Proper goggles can both protect your eyes, and absorb the glare helping you see better altogether. Ski goggles also control wind coming to your eyes preventing wind burn and excessive blinking. UV Protection: Ultraviolet light has been proven to cause a variety of eye disease as well as pre-mature aging. UV concentrations increase as altitude increase. Therefore, UV protection is a must. ( For more information, see UV and its Effects on the Eyes). Make sure your ski goggles have 100% UV Protection. Polycarbonate Lenses: This is the only type of lens that should be worn. Both glass and plastic lenses can shatter upon impact, and lens particles can penetrate the eye. Polycarbonate lenses are the most impact resistance, and will not shatter upon impact. Polycarbonate also is more resistant to fogging than any other lens. Plastic provide adequate protection, but still can shatter. Avoid glass lenses if at all possible. If doing prescription, it is ok to do CR-39 plastic lenses inside behind the front goggle lens as that front lens has some impact resistance. However, for the best possible protection, select polycarbonate lenses as well for the prescription insert. Frame Material & Style: Choose a plastic frame if going for sunglasses instead of ski goggles. Plastic frames fare better in the cold. Metal frames become brittle in the cold and may snap. Also, upon a fall, the nosepads on a metal frame can poke an eye. For frame style, wraps are very popular, as they wrap around your eye to keep out wind and snow (especially important for contact lens wearers). They also help block out incidental light from the sides, helping to minimize glare. Polarized Lenses: Glare manifest itself in what is called polarized light. Glare is most noticeable on high reflective surfaces such as water and snow. Regular sun lenses do not provide adequate absorption of glare. Polarized lenses absorb 98% of the glare reflected off the snow. Note: Polarized lenses absorb so much glare that you may not be able to distinguish patches of ice from regular snow. Polarized Photochromatic lenses are popular options as they change with various lighting conditions. Lens Color: When skiing in bright sunlight, you will choose to wear a sun lens. Choose a lens that is brown or amber in color as this will provide the best contrast against a white background, and is better for lower light conditions (i.e. when the sun goes behind the clouds). A photochromatic lens may also be useful. Photochromatic lenses change color with changes of light. Therefore, they will get darker in bright sunlight, and become lighter in an overcast sky. Vermilion or rose based lenses are good for overcast to flat light. In a really low light condition, yellow will help create contrast. Clear lenses are recommended for night skiing as using a tinted lens at night can reduce reaction time. Goggles: You may choose to wear a sunglass when skiing in sunlight, or wear a goggle while it is snowing. Use the same lens color guidelines as above. Make sure the goggle is well ventilated. Vents in lenses is preferred. If you wear contact lenses, you need to make sure that your goggle is well ventilated so your contacts do not dry up. Remember to blink a lot, as well, to help keep your contacts moist. For fogging, goggles with a fan inside can help create constant airflow to keep them defogged. Prescription Lenses: Prescription lenses can be fit in most sunglasses, including wrap styles. However, if you have a high prescription, it is better to stay away from wrapped frames, as the vision will be distorted on the periphery. For goggle wearers, an insert can be made up with a prescription to fit behind a goggle lens. There are also goggles that are made to fit over your glasses, however, this is often uncomfortable, and glasses tend to fog easier. Make sure to add a fog coating to the prescription lenses to help with fogging. Recommended Styles: For goggles, Bolle Ski Goggles, Julbo Ski Goggles, Smith Ski Goggles , Hilco Prescription Ski Goggles, Rudy Project Ski Goggles, Uvex Ski Goggles, Spy Snow Goggles meet all of the above requirements and all these brands have some styles are available with a prescription. For sunglasses Native are all Polycarbonate polarized. Anarchy makes nice wrap styles with a polycarbonate.Bolle also makes some polarized styles and polycarbonate lenses. Rudy Project makes polycarbonate lenses and some styles are available polarized. Julbo also makes mountaineering sunglasses with side shields for extra protection. All these brands also have prescription lenses available. 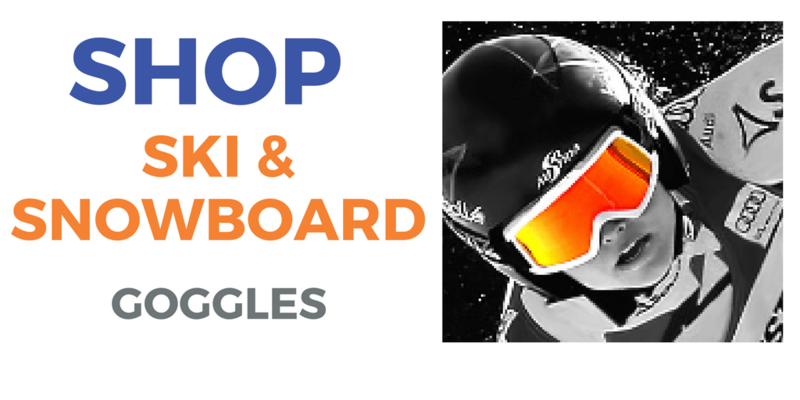 Shop all Ski Goggles Now!